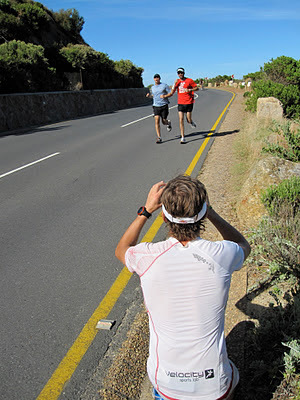 Today I ran with Ryan Sandes. I got to ask a few questions about his races from this year and about his experience at the Atacama Crossing. Along with some great advice I also enjoyed an amazing run along Chapman's peak and met some other keen trail runners from Cape Town. Hout Bay view from Chapman's Peak. Keen runners joining the Ryans2Run. Ryan taking photos for twitter. Thanks to Vida e Cafe for the free coffee at the end.